Erik Adams: When Arrested Development ended for the first time, it did so with some difficulty. It couldn’t have helped that Mitch Hurwitz and company were handed an abbreviated episode order with which to wrap up the dense-and-detailed saga of the Bluth family, but “Development Arrested” has never seemed to me like the send-off the best TV comedy of the 2000s deserved. Thankfully, it was merely a temporary send-off, but the rush to tie up loose ends while giving the show a suitably climactic sense of coming full circle resulted in an erstwhile series finale that’s more than a little half-baked—though part of that was a calculated risk to leave behind parts of the story that could be completed by whatever form Arrested Development took after it left the air. Even George-Michael repeats his own patterns in “Blockheads,” achieving a triumphant catharsis with his fist. It’s important to finish season four with an episode told from George-Michael’s perspective, because more than any other Bluth, he’s felt the full brunt of his family’s misdeeds. Noel wrote two weeks ago that Maeby is the closest thing the show has to an audience surrogate; George-Michael, meanwhile, is our best vessel toward understanding the Bluths. We saw the outcome of all the lying and the love (but mostly lying) in his gawky, teenage form, hopelessly naïve but able to see the good in each of his relatives. In his overtly sexual season-four guise, however, he’s finally discovered how to harness the full potential of his Bluthness—all the while casting off both of the names given to him by his father. And when George Maharis finally channels the last decade of frustration and disappointment into a punch to that father’s face, a transformation is completed. Anakin Skywalker has become Darth Vader, and his punch is backed by millions of fraudulently accumulated dollars. 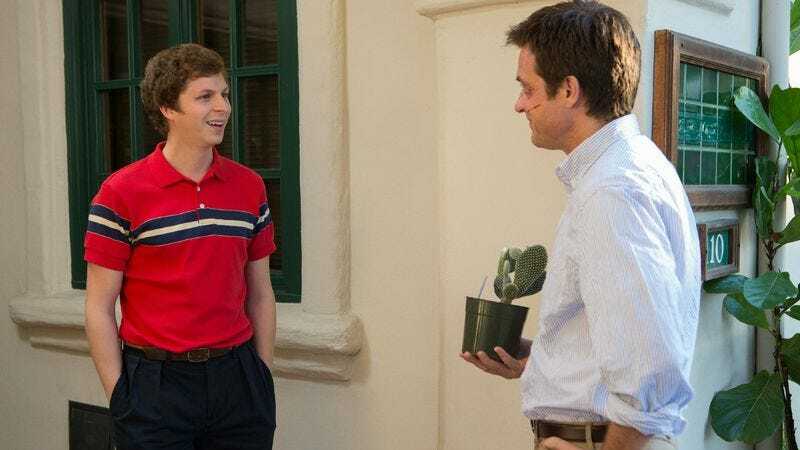 George-Michael Bluth always seemed like the role that trapped Michael Cera into perpetual man-childhood, so it’s exciting to watch the character become one that takes on the darker edges of the actor’s persona. (Because this site simply hasn’t written enough about the Scott Pilgrim franchise, there’s probably a good For Our Consideration to be written about how George-Michael is the true villain of Edgar Wright’s Scott Pilgrim Vs. The World film.) By forcing him down a spiral toward selfishness and self-preservation, “Blockheads” gives George-Michael the final weapons necessary for Arrested Development to end season four in the same way it started: With the Bluths scattered and squabbling. We already saw him do this to Maeby in “Señoritis”—that firing is presented here for comprehensiveness’ sake, but the truly important development in “Blockheads” is the one that brings the episode (and the season) to a close. To my eyes, “Blockheads” embodies the qualities of season four’s best installments—a full-ish story for the main character, a light touch when representing the other side of events we’ve seen previously—while doing some necessary plot work that echoes “Double Crossers” and “Indian Takers.” The episode is at its least exciting when it inevitably arrives at the boardwalk for Cinco De Cuatro, if only because we’ve already seen the most explosive, climactic incidents of the season’s ostensible climax. There’s really only one surprise left in the sequence, and considering it involves neither a literal explosion nor the mysterious disappearance of a Bluth rival, the reveal that the “blow back” is actually the work of a Mongolian horde—hired by GOB to build the fake barrier between the United States and Mexico—is a bit of a letdown. A letdown in terms of storytelling, maybe—but in terms of thematic resonance, it’s rich: The disgruntled Mongols mistaken for insulted Mexicans were hired in lieu of the Chinese workers whom George Sr. sought to not construct the border wall. Appearances are always deceiving on Arrested Development, but “Blockheads” takes this conceit to new heights of daffiness. Just take a look at how both GOB and Michael end up talking themselves in circles at separate points of the episode, beginning on one note (GOB decries “the age we live in” and its attendant pill-popping) and ending on the exact opposite (having worked his way through the benefits of various pills, GOB declares “What an age we live in, it’s great, isn’t it?”). He’s hiding his true feelings behind that front, and Michael later builds a similar façade as an attempt to return to Rebel’s good graces. It’s a hysterical illustration of the loops the Bluths get themselves stuck in, the cycles that begin anew in the “On the next…” portion of “Blockheads,” which finds GOB re-installed (or re-re-re-installed? How many times has this happened now?) as president of the company while yet another Bluth is rung up for yet another major offense. 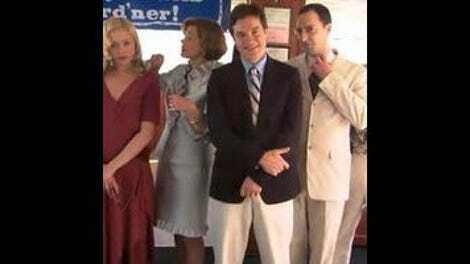 For an episode with so many parallels to another temporary Arrested Development conclusion, the season four finale also has a good time with the show’s twins/duplicates theme: Whereas “Development Arrested” found Michael learning he doesn’t have a twin sister, in “Blockheads” he’s assaulted for insisting that he and George-Michael could be twins. Noel, one of your pet Arrested Development themes shows up as the kicker to Lem Depardieu’s visit to Sudden Valley—did you catch it? And as someone who’s savored over the fourth season rather than binge on it, how does taking two months to arrive at “Blockheads” affect your opinion of the episode? As for whether slow-watching instead of binge-watching season four affected how I felt about “Blockheads”—that’d be impossible for me to say, really. I will say that I found the loose-end-tying of this finale less enjoyable than the snappy brilliance of the previous three episodes, yet nowhere near as exhausting as the rehash-heavy episodes from earlier this season. Maybe that’s a case of my having gotten used to this season’s storytelling over the past couple of months. Or maybe—more likely—it’s because George-Michael’s storyline is one of the ones I’ve found most rewarding. Like you, I was never the biggest fan of “Development Arrested,” but I think “Blockheads” works fairly well because it has more modest goals. It’s really about defining the differences between Michael and George-Michael, by putting them through a similar wringer. They’re dating the same irresponsible single mom. They’re both in charge of companies selling a nonexistent product. They’ve both been kicked out of a dorm room in a vote-first/no-talking scenario. They even nod to themselves in the same awkward way (as seen in a well-placed split-screen during one of their games of telephone lie-tag). So now, in “Blockheads,” the man who no longer wants to be George-Michael also rejects being “same” with his dad. Just as much as Buster, George-Michael is like the product of some twisted science experiment: placed in a crib with a Cornballer, motherless from a young age, compelled to do whatever his father asks, etc. Now he’s a grown-up with no romantic game (when Rebel says she’s coming over to his dorm and bringing birth control, he pseudo-suavely replies, “That’s perfect, because I’m not ready to have children,” and after they’re done being overtly sexual, he says to her, “Thanks for keeping it down for my R.A. … You were keeping it down, right?”); and a man so out of touch with the world outside Sudden Valley that when he buys a new house he makes plans to furnish it with Homefill. Even when George-Michael exuberantly bangs on a wall, he knocks down a picture, teaching him not to be too excited or happy. EA: And I think that’s where The Punch matters the most: It’s George-Michael making himself heard. Not in the way his father would prefer, and not in the way he was taught at Openings, but certainly in the way that has the greatest impact. It’s the perfect punctuation to Michael’s behavior this season, too. The Narrator’s typically right on the money, but Michael doesn’t hit his lowest point on the stair car with Lucille 2 in “Flight Of The Phoenix”—he hits it when he’s hit by George-Michael. I love that Jason Bateman doesn’t crumple after taking the blow, instead regaining his balance and squaring off with his scene partner. After indulging his own Bluth side throughout season four, he’s suddenly aware of what a prick he’s been. If the family history repeats itself (and it always does), someone’s eventually going to serve George-Michael with his own haymaker. I’m eager to find out who that is, and that’s a significant achievement for “Blockheads”: After all this time, here’s an ending that would give me no hesitation about clicking over to the next episode. But there’s no next episode to speak of, as much as this season finale argues that the story of Arrested Development remains incomplete. I can wait, though, because if there’s anything we can learn from “Blockheads”—and the season it concludes—it’s the virtues of patience. As for this particular follow-up, it’s awful nice that seven years of patiently waiting for more Arrested Development was, more often than not, rewarded. The best “on the next” in this episode: GOB, after getting a fresh sexual overture from a Forget-Me-Now-ed Tony Wonder, stares at his partially shaven face in the mirror for a long time, dabbing at the shaving cream, in another of this episode’s strangely quiet moments.